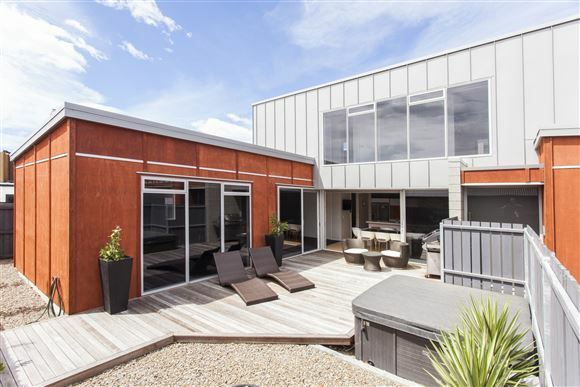 This modern and stunning townhouse should tick all the boxes and then some! Built post-quake (June 2013) the property in itself is 250m2 and set on a freehold title on 400m2 (TC2). Set back off the road on a rear site the property opens up to that all important North West, providing sun and shelter. Being a builders own home, the property has a real WOW about it with lots of extras loaded in. The ground floor features a large open plan kitchen/dining/living with an additional separate living area. A 2.7 metre stud height provides a real sense of space and full height cavity sliders connect the outside seamlessly with the home providing that all important indoor/outdoor flow. The master bedroom with a stunning ensuite and walk in robe plus a separate laundry complete the ground floor alongside the garage with a separate drive through door (perfect for parking a trailer). Upstairs there are 2 bedrooms, full bathroom and a separate toilet. The fourth bedroom is upstairs also and is currently configured as a living room, meaning this home can either be 4 bedroom/2 living areas or 3 bedroom/3 living areas. The property has an excellent and very efficient water heated radiator system meaning you should never feel the cold. Two hidden study nooks are perfectly placed for computer areas, meaning they don't impact on living rooms and are tidily tucked away with the close of a door. Conveniently located to both Merivale and Edgeware for shopping plus loaded with some of Christchurch's best school zoning being St Albans Primary, Heaton Intermediate, Christchurch Boys High School and Christchurch Girls High School. The owners are already eyeing up their next move and this property offers exceptional family living with a very convenient lifestyle. Call Foss today for viewing.